In order to guide for big game as an assistant guide in British Columbia, you must successfully complete the Assistant Hunting Guide exam and secure employment with a licensed guide outfitter. The exam is open-book and you have 90 minutes to answer 75 true/false and multiple choice questions. The threshold to pass is 75%. The fee is $250, and you are allowed three unsuccessful attempts before you must pay again. 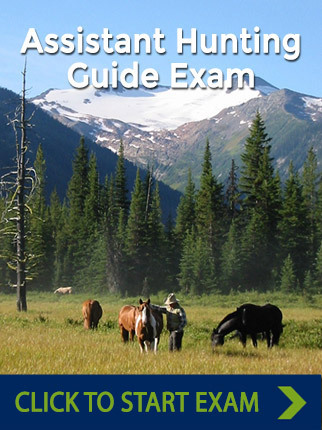 The purpose of the Assistant Hunting Guide Certification exam is to ensure that all guides have consistent and adequate knowledge of wilderness safety as well as provincial laws and regulations. Upon successful completion of the exam, you will receive an authorization, which will allow you to be employed by a licenced guide outfitter. If you are a non-resident, please ensure that you have the proper work permit or visa to allow you to work in Canada. Finished Studying - Start the Exam!